I lost my mobile yesterday night while i m on the way home in a train.Its about 10:30 pm when that happen.since its late night there were only few people in the train.This happen when the train stopped at the Bulugahagoda(between Gampaha and Ragama). I was holding the phone because i got a phone call just before that happen.Suddenly one from the back grabbed my phone and run away and jump from the Train.I was fraction of a second late from catching him. 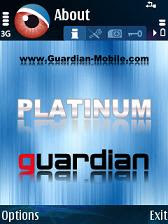 The reason i m blogging now is to explain how the Guardian-Mobile which is installed in my mobile helping me and the police to track the guy who is using it. I have registered my sim as the user sim in that software.So when some one change the sim in my mobile , my mobile send a SMS from my mobile to a pre-configured no(In my case its my brothers no). Now i'm getting updates from my mobile about the SIM changes containing above info.I have provided that information to the police So they can get the user information form the service provider. IMEI can also used to track a user. IMEI is a unique number for a given mobile device.when that device try to do any data transfer it sends it IMIE to the service provider (Which get logged) even a service provider can reject any data transfers from a given IMEI.So we can use this to track the device and also to make is useless to the user. cell id and area id are GSM network specific details which can be used to track the mobile location. I have already given up in finding my mobile but i hope at least police will be able to track the guy or the gang who did this which is finally good for the Country. IMHO even the Gardian free edition is good for general use. Nice post. Today I talked with an OIC. He told they have the facility to track the phone with IMEI number. But this facility doesn't support for AirTel network. Hope the thief doesnt use it with an AirTel SIM. Anyway OIC I met is a good young guy. He took the case very seriously since i told him the lost phone is a very valuable one. He told that the case will brought to court asap and then they can start the hunting.